Every year, Russian retailers and transportation companies lose tens of millions of rubles due to inefficient use of storage space and vehicle fleet. This occurs as a result of a lack of the efficient technology for measuring weight and size of goods and cargoes. Surprisingly, in the age of digital technology, tape measures and rulers are still commonly used in the market. Russia’s hardware startup InSize, which was launched last year, is seeking to change the situation. The company has already offered several hi-tech solutions for measuring weight-and-dimensional characteristics of goods and cargoes with the use of the latest scientific and technological achievements. These operations take only several seconds, which allows for saving money and improving warehouse efficiency. 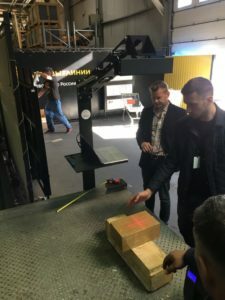 Prior to launching his own project, InSize founder Grigory Bocharov had worked for foreign companies, including those specializing in logistics automation and delivering ‘smart scales’ for warehouses in Russia. Today, Bocharov’s startup offers a domestic solution that allows retailers and transport companies to quickly and accurately measure dimensions of goods, cargoes and pallets. The company’s first product is the smart scales InSize 1000 that can be used for measuring regular objects, such as boxes. Today it is used by most of the company’s Russian clients, as well as clients from Lithuania and Finland. The device can measure the dimensions of free-form and transparent objects. The solution includes a special desk equipped with a moving frame and an infra-red sensor system. The data are then automatically sent to the Warehouse Management System. InSize Scanner allows users to receive the dimension and weight of any item accurate within 2 mm. These data help optimize slotting, storing, selecting and packing orders, as well as transportation planning and workload. For instance, Bocharov notes, the labor efficiency during the acceptance of delivery increases by 40%, with only 12 seconds required to measure the goods instead of 68 seconds. One of the clients has reported a 20% reduction in order packing expenses and a 7% reduction in transportation expenses. Such solutions can really enjoy demand in Russia, a representative of Wildberries said. With exact weight and dimensional data, goods can be positioned at storage sites accurate to a centimeter, as well as distributed according to tasks: the system will be able to determine the optimal placement. If companies want to remain competitive, they have to optimize the work processes at warehouses, introducing IT systems and robots, Oleg Gaidayenko, head of the mobile solutions department at Panasonic Russia, added. He certainly meant companies with high enough turnover. At present, such advanced warehouse equipment is mostly manufactured abroad. The closest solutions, analogs from foreign manufacturers, cost from €20K, SDEC commercial director Maxim Tolstobrov notes. Last year, his company failed to find the right solution for an affordable price and eventually developed its own equipment – an automatic cargo re-measuring station. The solution from InSize will not only be 30% cheaper than imported equipment. Western devices cannot measure the weight correctly regardless of the item’s position on the scanner. InSize has solved this problem, so now the item to be weighted can be put anywhere on the scanner. InSize has already attracted investment from the Internet Initiatives Development Fund (IIDF) twice, RUR 2.8 mio ($42K) in 2017 and another RUR 18 mio ($272K) in May 2018. As of the end of 2017, the company earned RUR 20 mio ($302K). InSize reports that the project is growing very fast, specifically, 16 times the initial size by now, a figure that will be doubled within a few months. This year already, the company is not ruling out another investment round, both for existing projects and new developments (the latest involve improving storage facilities to resolve the issues of both the excessive and insufficient storage areas). Recently, the company completed a new development and tested it for a Russian transport company. The new solution will get rid of the mechanical moving frame assessing dimensions, and simplify the structure. All measurements are now taken by a 3D camera. The new solution significantly reduces the scaling time, down to under one second. But most importantly, it is a universal device that will measure both incoming products and outgoing freight and pallets. InSize expects that thanks to more precise size evaluation of outgoing freight, companies will be able to save 15% to 20% on shipping costs. In e-commerce, shipping costs account for 7% to 8% of revenue, according to Grigory Bocharov. Therefore, companies will save up to 1% of their annual revenue. For companies like Wildberries, it is hundreds of millions of rubles. “Saving even 2% to 4% of the revenue is substantial during crisis,” Grigory Bocharov concludes.